Italy presents a success story in organic fruit and vegetable production, taking advantage of favourable climate and agronomic conditions and close geographic access to major markets. Organic farming growth in Italy is rapid and the domestic organic market is taking off. Relatively high financial support for organic producers has played an important role in the rapid production development. Unfortunately, bureaucratic impediments have thus far made it very difficult for importers to bring organic fruits and vegetables directly into Italy. Most organic import trade is therefore triangular. As the Italian consumer is not wedded to purely local organic produce there are opportunities in the rapidly growing but so far small market for organics. Article 11 certification would make the exporters' job far easier. Since 1998, Italy is the European country with the largest area farmed organically as well as with the highest number of organic farms. The Italian organic sector has exhibited one of the largest average annual growth rates in Europe in the past years: the certified organic and in-conversion utilized agricultural area (UAA) has increased from about 5 000 hectares in 1985 to some 960 000 hectares in 1999, almost 200 times as much. A similar path is found for the number of organic farms, passing from 600 to above 49 000 in the same period. Data for 2000 give an organic area of 1 040 377 hectares. Source: 1985-1992 estimates from various authors; 1993-1999 GRAB-IT & FIAO. Growth in the number of organic farms and in organic land area was relatively slow and steady in the first years, but since 1992, annual growth has been significantly higher than before, with some slowdown in the past two years. The increasing growth seems related to the implementation of EC Reg. 2092/91 on certification, which took off in 1992 and was finalized in 1995, as well as EC Reg. 2078/92 on support to environmentally friendly farming - including organic farming - which was implemented between 1993 and 1996 in the different regions of Italy. Although not all certified land has received support according to EC Reg. 2078/92, the support paid to organic farmers is still one of the major causes of Italys large organic sector. A domestic market for organic food did not develop until recently, so growth in the number of Italian organic farmers seems partly built on financial support and partly on exports. The individual regions of Italy have developed quite differently: major growth has recently taken place in the southern regions and on the islands, which altogether account for about 70 percent of total organic UAA in Italy (INEA, 1999). No detailed official information is available on acreage and production of organic horticulture in Italy. The Ministry of Agriculture provides data, which are not disaggregated at the crop level but only on the basis of farm types. Horticultural holdings1 in 1999 represented 6.7 percent of total organic UAA. In general, organic horticulture is not as policy-supported as cereal and fodder production. Despite the estimated income losses due to conversion to organic farming, vegetable farming generally does not receive higher payments than other land. Organic fruit orchards, on the other hand, generally receive higher subsidies than other crops, but often these still do not cover all income losses related to organic fruit growing. However, only part of the total output goes into organic market channels, and, therefore, is paid for with price premium. There is room for further reduction in producer prices resulting from a larger supply entering the market in the future. The main organic fruit produced in Italy are citrus (mainly lemons and oranges), apples and peaches, while the main vegetables are tomatoes, carrots, lettuce, cauliflower, onions and fennel, though, again, no data on actual production exist. More than 50 percent of fruit producers are located in Sicily; other regions specialized in organic fruit production are Campania and Friuli, though in these regions the organic sector is weak. In Emilia Romagna - traditionally a strong fruit producing region - organic fruit production is still not very developed, though its importance is recently increasing with the entrance in the organic market segment by two large cooperatives Conerpo and Apofruit. Vegetable production follows a similar geographic pattern, given that most organic vegetable producers are located in the southern regions of Sicily and Apulia, together totalling more than half of the land of vegetable farmers (Zanoli, 2000). Trends of organic fruit and vegetable production are positive, though recently retail sales are increasing at higher rates (over 40 percent per year) than production. Support for organic farming is provided within the EC framework (EC Reg. 2078/92 until 2000; and EC Reg. 1257/99 as from 2001). In 19982, the organic support measure accounted for 27.5 percent of the total EC Reg. 2078/92 agro-environmental expenditure: 175.2 million euros were paid to 539 528 ha (approximately 325 euros/ha on average). It has to be noted, though, that in most cases, the organic subsidies played the role of direct-income support to marginal regions and areas, boost the supply of organic products sold as organic on the market. This is also an explanation of the uneven distribution of organic farming in Italy and its concentration in the marginal areas. No financing of low-input farming measures of EC Reg. 2078/92 in some regions, while organic farming receives subsidies. This has boosted the adoption of organic farming. Insufficient or non-existent differentiation of subsidies between low-input and organic measures. In this case, organic farming is disadvantaged, especially if prescriptions of low-input measures are comparatively less stringent. Insufficient level of subsidies and low differentiation of subsidies between different crops. In general, farms with cereal and forage crops have benefited (and adopted) the most, while few vegetable farms have adopted organic farming, due to insufficient subsidies compared to income losses. Lack of technical advice and extension services for organic farming. The higher level of bureaucracy (forms to be filled, etc.) compared to other farmers, which has particularly discouraged the adoption of organic farming by small farms and aged farmers (the majority in many rural areas). As some farmers express, it is strange that organic farmers are the ones who need to demonstrate that they do not use harmful substances, while other farmers can use toxic pesticides and other potentially dangerous inputs without asking for any authorization or filling any form. The Italian Government has recently established a tax on pesticides, of which the revenues should partly be devoted to promote the market (and specifically domestic demand) of organic products. However, no form of organic market support is currently implemented. No official data exist on the market of organic products in Italy, and most existing estimates are based on previous work of the authors. Therefore, there are no official data on the quantities and values of organic fruit and vegetables produced, exported and imported. Total retail sales of organic food in Italy is estimated by the authors at Lit2 038 billion (little less than 1.1 million euros) in 2000. Italy mainly exports raw products (of which fruit and vegetables account for about 50 percent) and mainly imports processed organic foods. Fruits and vegetables are estimated to account for 27 percent of total retail sales in 2000 (see Table 1), approximately Lit550 billion. The volume of domestic production of fruit and vegetables is estimated to be, respectively, 474 000 and 44 000 tonnes. Only part of it goes to the organic market; some 30 percent is still sold in the conventional market for various reasons3. Most of it is marketed by primary market operators such as BRIO (organic turnover: Lit31 billion), ECOR (Lit30 billion), APOFRUIT (Lit30 billion), CONERPO (Lit13 billion) and MUSTIOLA (Lit30 billion), who also act as import/export agents. APOFRUIT and CONERPO trade in conventional products, too; all others are specialized in organic farming. Citrus represent 63 percent of Italian fruit production, with more then 150 000 tonnes of oranges and around 100 000 tonnes of lemons. Source: ISTAT & Authors estimates. A very large share of organic fruit and vegetables is exported to other EC countries (mainly northern Europe) and Switzerland: 50 percent of the vegetables produced and 60 percent of the fruit. Michelsen et al. (1999) reported a higher share for fruit in 1997 (70-80 percent), but since then the domestic demand has increased. In any case, the high fruit export values are mainly due to citrus exports. Imports of organic fruit and vegetables are estimated at about 17 000 tonnes, of which 55 percent is represented by bananas. The total import value is approximately Lit35 billion at wholesale prices. Until 1993, organic fruit and vegetables in Italy were sold only in specialized organic outlets (about 750, herbalists included) through direct farm sales and in occasional organic open-air markets. Few supermarkets sold organic convenience foods, such as wholemeal pasta, tomato sauce, etc. In 1993, Brio (at that time a ltd. company owned by five organic cooperatives, now a company with a turnover of about Lit31 billion and whose equity capital is worth Lit1 billion in 2000) inserted fruit and vegetables in a Coop supermarket near Treviso, in the north-eastern region of Veneto. The test resulted positive: after a few months, organic fruit and vegetables represented 10 percent of the sales volume of fruit and vegetables and about 1 percent of the total turnover. Coop (which is the largest supermarket chain in Italy) extended the organic line (at first "Coop naturali e biologici", now "Coop Agricoltura Biologica") to other outlets in northern Italy, followed by their major competitors. In 1996, there were 130 supermarkets (and hypermarkets) with organic corners; in 1999, there were 624. At present there are about 1 400 (out of 6 200), most of them running private labels. The highest share of supermarkets selling organic fruit and vegetables is in northern Italy, which is the richest area of the country (Tuttobio, 2001): 71 percent totalling to 1 005 outlets (491 in 1999). In central Italy there are 315 outlets (113 in 1999); in the south, 67 (16 in 1999) and 52 on the islands (Sicily and Sardinia: none in 1999). The most important chains are (in alphabetical order): French-owned Auchan/SMA, A & O; Austrian-owned Billa, Colmark, Conad, Coop, Crai, Despar, Esselunga; and French-owned (Carrefour) GS, Il Gigante, Iper, Pam. Not all of them sell organic fruit and vegetables in their entire distribution network. Marketing policies of supermarket chains vary. Coop, Esselunga and Conad are investing in advertising, merchandising and promotion; others seem to have chosen a "me too" policy. The most relevant actors are Coop (which announced its decision to gradually eliminate conventional fruit and vegetables from its range, with organics as premium line and low-impact - IPM products - as mass line) and Esselunga, whose organic range includes about 300 items (convenience, dairy, fruit and vegetables) and who carried out a major advertising campaign. In 2000, the number of supermarkets with an organic fruit and vegetables corner exceeded the number of specialist outlets (less than 1 000 throughout Italy, especially in northern and central Italy). However, as the most relevant range in supermarkets consists of no more than 300 items, the importance of specialized organic outlets (with a mix of 1 000 to 2 500 items) is confirmed, although they have lost their channel primacy. 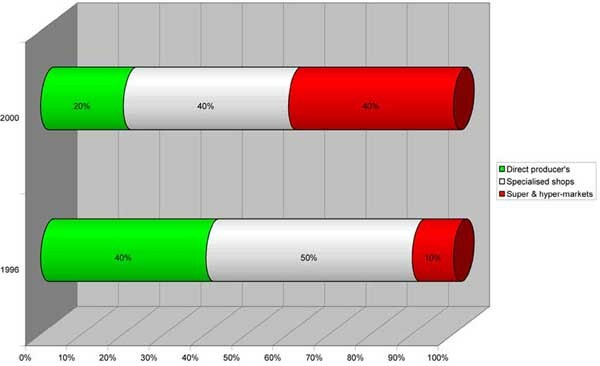 In fact, organic specialized shops show a positive trend both in sales and in new openings: while conventional shops are closing (in 1993, there were 263 686 food shops in Italy; in 2000, 141 000) and retail sales concentrate in larger supermarkets and in hypermarkets, while organic ones are increasing in number and enlarging at the same time. Furthermore, in the last years, a few franchising chains (Naturasì4, Bottega e Natura) have opened and now own around 40 outlets mainly located in central and northern Italy. Figures 2 and 3 show the main distribution channels of organic food in Italy as well as of organic produce. Currently, supermarkets do not buy their fruits and vegetables directly from the producer, but refer to specialized wholesalers or consortia of growers: both are good targets of non-EC companies who want to enter the Italian market. Organic consumption accounts for little less than one percent of household food expenditure. A recent, unpublished survey by ISMEA-NielsenCRA5, using their Telematic Panel of 3 500 households and asking focused questions, has given a more realistic picture of the market size. A total of 29 percent of consumers declared to occasionally buy one or more organic products less than once a week, while 5.6 percent declared to buy in three out of the five convenience product categories (cereals, fruit, vegetables, milk and dairy products, meat) at least once a week. Of these, only some are correctly informed on the definition of organic products. This gives a percentage of regular and well informed self-declaring consumers of organic products of 1.3 percent. Indeed, one of the major obstacles for an increase in demand of organic products in Italy, is lack of information and confusion for the consumer. In the above-mentioned survey, using a seven-item scale of consumer information, only 15 percent of respondents are classified as "highly informed"; 54 percent have a very low level of information and confuse organic products with "natural", "low-input" or even "wholemeal" and "macrobiotic" products. Among these, almost 15 percent believe that organic products are produced only in Italy, and the remaining simply do not know if imported products could be labelled as "organic". The average retail price for organic fruits and vegetables is 50 to 200 percent higher than the conventional one. Generally, consumers pay a higher premium for vegetables than for fruit (especially carrots, onions, garlic and potatoes); nevertheless, some imported fruit, like bananas, are sold at prices ranging from 100 to 200 percent higher than non-organic ones. Weekly wholesale prices are reported at the E-BIO Web site; for the northwest area, by the Turin Municipality Web site. Web addresses can be found in Annex V. A sample of wholesale prices is reported in Table 2. In the past two years, domestic demand has grown at very high rates. Fruit and vegetables are the largest growing sector of organic demand, which is coupled with the decreasing demand of meat and dairy products, after the recent BSE scares. Consumer confidence needs to be restored and an increase in vegetarianism and in fruit and vegetable consumption is foreseen and even suggested by Health Authorities. Altogether, this has positively influenced organic produce demand in the last months. Databank (2000) reports an increase of 200 percent in fruit and vegetable retail sales in hyper/supermarkets between 1997 and 1999, and 133 percent in 1998/99. These rates are even higher, according to interviewed wholesalers, for 2000. Globally, according to the authors estimates, fruit and vegetable retail sales have grown at a rate of 80-90 percent per year in 1998-2000, as is also reflected in the growth of the total organic sales of the major wholesale companies, whose balance sheets are easily accessed at http://www.cerved.it Organic specialized shops are growing too, but not as fast. In the future, an expansion of specialized retailer chains, such as Naturasì and Bottega e Natura, is foreseen, as well as a more serious entry of other major modern retailers, such as Auchan and Carrefour. Most of the threats to demand growth can be seen in consumer information, which, as already mentioned, is one of the major constraints to a larger organic market share. A promotion and information campaign will be launched soon by the Government, in order to increase the domestic demand of organic food. If it is effective, it is likely that a larger share of consumers (the mainly sceptical, non-informed or doubtful of the actual safety of organic food) will enter the market on a more frequent basis. Achieving a market share of 5 percent by 2010 (around Lit10 000 billion at 2000 constant prices) is a possibility. Italy follows the basic EC Regulation on organic food products (EC Regulation n.2092/91). Organic products originating from non-EC countries may be imported and marketed only if products are grown (and eventually processed) and certified according to procedures equivalent to those of the EC. With Circular letter n.3 (16 June 2000), the Ministry of Agricultural Policies (the Italian designated authority) settled new procedures on how the imported foods are to be labelled as organic. The importer has to send an application to be included in the "National list of importers of organic products" to the competent authority (the same Ministry) and to the selected inspection body (in Italy nine national inspection bodies are authorized under the authority and supervision of the Ministry). If the exporting non-EC country is included on the list (article 11), import can begin immediately, but if the country is not included, the importer has to present a special form. If the inspection body is EC based, proof of its authorisation in its country has to be provided; if the body is non-EC based, it has to present a certificate declaring that production rules are equivalent to those laid down by Article 6 of Reg. 2092/91 and detailing which Authority is competent for setting the standards and performing surveillance on the bodys activity. The inspection body must present a report on production (or harvesting of wild products or processing), geographical location and access roads, the kind of business and property of them. Enclosed in the report are: maps in which organic, non-organic and non-cultivated plots are singled out; a description of crops and of growing techniques used (including fertilizers, plant protection products); a list of public institutions and bodies connected to the producer; date of entry into the control system; a declaration stating that, for at least three years before harvesting, only products composed and substances listed in Annexes I and II of EC Reg. 2092/91 were used; a declaration stating that the harvest of wild products is not harmful for the environment and the species. Finally, facilities used for processing, handling and storage must be detailed. After having acquired these documents, the Ministry considers whether the production, harvesting and processing standards, as well as the inspection and certification system, meet the requirements of EC Reg.2092/91. The selected certification body cannot assist the importer with the file and cannot reveal any information on the procedure. From 1994 to 2000, 118 applications for organic import were presented, but only 59 were approved. However, the procedure for importing is a very bureaucratic approach; the Italian Ministry has accumulated a six-month backlog, and another three months are required to close it. Moreover, authorization is valid only for one year. In an attempt to avoid this bureaucracy, most Italian wholesalers buy triangularly: Italian companies do not buy raisins from Turkey or bananas from Uganda, but from Germany, the Netherlands and other countries in which the competent authority makes the work of importers easier. The growing Italian organic market increases the need for imports, and several companies have started cooperation programmes with non-EC countries; operators are pressuring the Ministry to simplify procedures without evident results so far. The bureaucratic difficulties to obtain organic import certificates from the Italian Ministry of Agricultural Policies: more than six months of delays and, in some cases, refusals, are reported by the operators. Most certifying bodies operating in Italy in the past years have been too busy to cope with the Italian organic boom and have not given particular attention to third countries' import trade. Recently, however, there are signs of change, and some certifiers have established joint ventures, especially in Mediterranean countries (i.e. Egypt), to certify organic produce imports. The size of the Italian domestic organic market is still relatively small, and most wholesalers prefer triangular solutions because it allows smaller quantities (and smaller stock volumes/higher stock rotation) and can be organized in partnerships with operators who are often buyers of Italian exports (non-cash transactions). The authors conducted a survey of the seven major importers/wholesalers of organic products in Italy, using questionnaires sent by e-mail and followed by telephone or personal interviews. The aim was to evaluate current levels of imports of organic fruit and vegetables in Italy, as well as accessing future trends and prospects for market growth in the next years. Based on this survey, just under 17 000 tonnes is estimated to have been imported into Italy in 2000, but as mentioned, the majority of these imports are not directly imported from the producing countries but actually re-exported by other EC countries to Italy. Concerning fruit imports, bananas are the second largest import, followed, respectively, by apples and kiwi. Much smaller quantities include strawberries, avocados, mangoes, papayas, pineapples and other fruits. Dried nuts and sultanas account for less than two percent in volume of total imports and about three percent in value. Among vegetables, carrots and onion account for more than 75 percent of imports in quantity, followed by potatoes. Minor quantities include cabbages, cauliflower and aubergines. The main importers of fruit and vegetables coincide with the three main primary market operators (ECOR, BRIO and APOFRUIT), which also act as importers, with the exception of ADRIAFRUIT, which specializes in bananas, and ORGANICSUR, which specializes in imports from Colombia and Argentina. Some residual import is also done by processors. A list of wholesalers and processors who also act as importers, is found in the Annex. Excluding imports from Colombia (bananas) and Argentina (apples and pears, onions and off-season citrus), most of the produce is not imported directly from producing countries but triangularly with the first importer in other EC countries. The largest Italian importer is ADRIAFRUIT, which trades in bananas and runs the trademark Bio Adria for its organic line. The company reports a continuous and constant increase of demand for organic produce. The company imports an average of five containers per week (1 000 boxes per container, average weight per box 18.14 kg, total 90.7 tonnes/week); it imports triangularly from Ecuador and Peru through other EC countries (large conventional banana importers). While the price of non-organic bananas fluctuates between Lit20 000 and 30 000 per box, the price of organic bananas is fixed at Lit38 000 per box (duty and taxes charged), with a premium price of 43 to 82 percent. ADRIAFRUIT also imports off-season pears (43 tonnes/year) from Argentina through another Italian conventional importer and is interested in starting the import of pineapples, mangoes and cherry tomatoes. As mentioned before, the Italian Ministry of Agricultural Policies complicates direct import from the country of origin; therefore, ADRIAFRUIT is currently importing triangularly from other EC countries, and has taken the Ministry to court for not having issued certificates in time, upon request. Smaller volumes of organic produce are imported by ORGANICSUR, which trades with many countries (see their Web page for a complete list) but specializes in banana imports from Colombia (around 1 300 tonnes/year) and Argentina (where it owns a farm of 155 ha). ORGANICSUR, however, is the largest Italian direct importer specialized in organic products. It only trades organic products and owns direct import certificates from the Italian Ministry of Agricultural Policies, as well as commodity-specific import licences. The company has been growing at a rate of 50 percent per year in the last two years and is interested in new contacts. Another large importer is VEROBIOFRUTTA, which bought a fruit farm in Argentina (about 10 hectares), producing about 400 tonnes of apples and 200 tonnes of pears. Since pears are in high demand in the Italian market, due to the relatively difficult organic management of pear orchards, the company is considering increasing pear production at the expense of its apple orchards. ECORs main imports consist of bananas (400 tonnes/year), apples (200 tonnes/year) and smaller quantities of pears and carrots, while BRIOs imports are mainly bananas (580 tonnes/year), carrots (460 tonnes/year), onions (340 tonnes/year), potatoes (200 tonnes/year) and pears (450 tonnes/year). Neither ECOR nor BRIO import directly. A small direct importer is SWEET, only importing nuts and other dried fruit (especially sultanas and apricots). Latin America and the Caribbean: the Dominican Republic, Argentina, Colombia and Peru; and Oceania: New Zealand. Minor suppliers are other EC countries such as Spain (avocados), Austria (onions), and the Netherlands (carrots, potatoes). Some imports tend to be concentrated in some import countries, due to comparative advantages (such as climate and lower labour costs) and in order to reduce transport costs. For example, most apples, pears and oranges come from Argentina; grapefruit from Israel; carrots and garlic from Egypt9; cabbage and cauliflower from Poland. Bananas come from Ecuador, the Dominican Republic, Peru and Colombia; pineapples10 from Cameroon and the Dominican Republic. Argentina and Ecuador account for the largest overall volumes. The specific situation of Italian organic imports and its legal and bureaucratic constraints does not render re-exporting attractive for commercial companies. However, within partnership agreements some apples and pears that are directly imported from countries on the "article 11 list" are re-exported to other EC countries (mainly to Germany), together with other domestically grown fruit and vegetables. Nevertheless, this practice concerns only residual import volumes. Importers declare that the trend is to increase imports, especially of those products for which the demand exceeds domestic production (onions, carrots, potatoes, peppers, cucumbers, aubergines, lettuce, regarding vegetables; kiwis, apples, pears and melon, regarding fruit), as well as of typical tropical fruits (pineapples, mangoes, avocados, coconuts). From the results of the authors survey of importers and wholesalers, an annual growth rate ranging from 30 to 50 percent is expected for the next years. Imports of dried nuts and raisins will rise more slowly (around 20 percent globally in the next 3 years), especially based on processors demand. The major constraint to import into Italy for "non-article 11 listed" countries is, as already mentioned, bureaucracy. Import certificates can take up to eight months to be released, and in some cases are not released at all. For this reason, some non-European Mediterranean countries (e.g. Egypt) are already working on equivalency, in order to increase organic export capacities, especially of vegetables. IMC (one of the Italian certification bodies) has established a joint-venture in Egypt for equivalency certification in the near future. However, if the procedure is simplified, an increase of imports could particularly benefit those neighbouring Mediterranean countries that can provide off-season, high value-added products to Italian importers. Second, some products will never enter the market during the Italian production season due to the large quantities produced in Italy; this applies to citrus fruit (lemon is the most exported product according to BRIO). At the same time, processors are looking for imported raw materials which are cheaper than those produced in Italy; this applies to tomatoes, carrots and celery and, in the future, possibly to concentrated citrus juice as well. Third, although Italian consumers have no particular strong preferences for locally-grown foods, many specialized shop managers do prefer trading local products (especially vegetables), for ecological reasons. Fourth, apart from organic standards, traditional quality standards (e.g. calibre, maturation levels) are more and more a pre-requisite for entering the market. Most importers - even if triangular - want to ensure the total traceability of the products and often require to be able to do their own inspections in addition to those provided by certification bodies. Finally, at present, the hyper/supermarket chains do not operate directly on the import market, but use the main wholesalers as intermediaries. In the near future, they could decide to enter the import market themselves, and this could change some long-established import partnerships. So far, importers BRIO and ECOR have favoured cooperative producers and established medium to long term contracts, without requiring any entry fee; in the future, however, the retail groups might follow a different strategy, based on higher competition, initial entry fees and spot purchases. In Italy, which has the largest organic sector and the largest potential supply in the EC, the domestic demand has recently started to increase significantly. A cautious scenario is that five percent of total food consumption could be organic by 2010, given the large increase of retail sales in the last months and the recent findings of the most recent consumers sample surveys on purchase intentions of potential organic consumers11: around 12 percent of informed consumers occasionally buy organic products and the repurchase intentions are quite high. At present, 30 percent of the Italian organic produce still goes into the conventional market without premium prices; 50 percent of the remaining 70 percent is exported. Nevertheless, part of the increase of demand will probably be met through imports because some of the most demanded products (e.g. onions, carrots, apples and pears) are not easy to grow organically in intensive farming areas due to the lack of farmers technical knowledge, as well as to insufficient organic advisory services. Marginal areas can produce high demand quality products (e.g. potatoes) but at higher costs, due to low productivity in those areas and poor accessibility. The need for specific organic import certificates and long, bureaucratic procedures for potential exporters (for countries that are not on the "Art. 11 list"). The early stage of the domestic organic market in Italy, making it a risky market due to the relatively small size (also in financial terms) of most market operators and to the high volatility of prices and demand (especially after periodic food scares, such as the BSE crisis, dioxin, etc.). The expansion of Genetically Modified Organisms (GMOs) in the agricultural sector is likely to be higher in potential exporting countries than in Italy and Europe. Some Italian and European consumers are particularly concerned about GMOs in their food, and, although EC organic standards specifically ban the use of GMOs in organic production, there is always the potential risk of genetic pollution, especially in large open field areas which often prevail in developing countries. In the future, traceability will be a strong requirement for most EC importers, as well as absolute absence of GMO contamination of imports. Since organic agricultural production (but not necessarily processing) is generally more labour intensive than conventional farming, in the long term third-party developing countries might have some comparative advantages in selling their products to Italy and Europe, especially those who can certify equivalence, according to Article 1112. But the relatively small size of the organic market combined with potential non-tariff barriers, such as traceability requirements, non-GMOs residues and similar concerns, could reduce these opportunities and the profitability for organic exporters. Agricesena (eds.) (1998): Lortofrutta biologica in Italia: dati di produzione e mercato, dattiloscritto, Agrobiofruit, Cesena. Bagnara G.L. (1994): Il consumatore di prodotti biologici: analisi della domanda e potenzialità del mercato. Rivista di frutticoltura, 4. Compagnoni A., Pinton R., Zanoli R. (2000): "Organic Farming in Italy", in GRAF S., WILLER H. (eds. ): "Organic Agriculture in Europe: Current Status and Future Prospects of Organic Farming in Twenty-five European Countries", SÖL, Bad Durkheim. Crescimanno M., Guccione G., Schifani G. (1998): Contributo alla conoscenza del ruolo dellagricoltura biologica nel settore primario della Sicilia. Economia Agro-alimentare, 3(1). Michelsen J., Hamm U., Wynen E., Roth E. (1999): The European market for organic products: growth and development. Technical Report of the FAIR3-CT96-1794 Project "Organic Farming and the CAP", dattiloscritto, South Jutland University Centre. Naspetti S. (2000): Lanalisi motivazionale nel marketing ecologico: il caso dei prodotti biologici, unpublished Ph.D. thesis, Ancona. Pinton R., (2000): "Sempre complicate le importazioni di biologico", Informatore Agrario, Nov.
Santucci F.M., Marino D., Zanoli R: (1996): Canali di commercializzazione e comportamenti dacquisto dei prodotti alimentari biologici in Italia. Atti del Convegno "Lagricoltura biologica: problemi e prospettive", Università degli Studi di Cassino, 17-18 maggio 1996. Kappa, Roma. Various Authors (2001): TUTTOBIO 2001, Organic Yearbook, Distilleria, Forlì. Zanoli R (1999): Economic performance & potential of organic farming, comunicazione al Convegno "Organic Farming in the European Union - Perspectives for the 21st Century", 27-28 maggio 1999, Baden/Austria. Zanoli R. (1997): Lagricoltura biologica. In INEA (a cura di), Annuario dellagricoltura italiana, Vol. L (1996), il Mulino, Bologna. Zanoli R. (1998): Lagricoltura biologica. In INEA (a cura di), Annuario dellagricoltura italiana, Vol. LI (1997), il Mulino, Bologna. 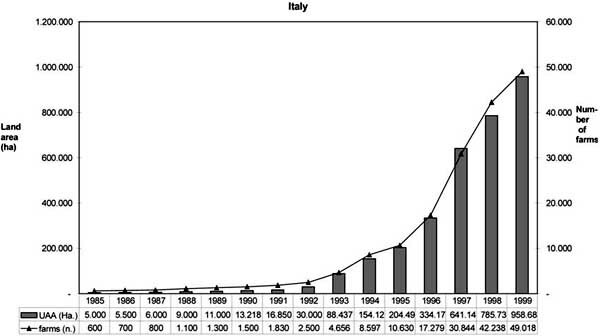 Zanoli R. (1999):The organic boom in Italy", Ecology & Farming, 22. Zanoli R. (2001): Fattori di sviluppo dellagricoltura biologica, in Marino D., Zanoli R. (eds.) Innovazione e ambiente. Figure professionali e fabbisogni formativi per lagricoltura biologica. Tellus, Rome, in print. Zanoli R. (2001): 66) "Prodotti biologici e mercato alimentare" (Atti del Convegno della Società Italia di Economia Agro-alimentare: "Il sistema agro-alimentare nazionale alla vigilia del terzo millennio", Ancona, 30 giugno - 1 luglio 1999), Ancona, in print. There are about 400 points of sale of fair trade products, linked with the above mentioned import organizations, which buy directly or by means of European partner companies. They sell only packed foods (jams, marmalades, juices, dried fruits etc.). Retail prices are usually lower than those in specialist organic shops, as they are run by volunteers. staff able to give legal, commercial and financial advice. From the home page: "Naturabella is an Internet trading company focusing on the organic food and natural product sector. We are using innovative tools and exploiting the power of the Internet in order to meet the demand with the best supply available". A virtual marketplace for organic food and drinks, they have quite an extensive catalogue ranging from baby food to canned fruit and vegetables. One of the first born e-commerce sites, though not too rich in terms of a companies database. However, it has a very nice look and a lot of general information is provided. Another e-commerce site, for both organic and other "green" products (eco-soaps, herbs, etc.). A Web site useful for its section on organic regulations. A site managed by Turin Municipality, with wholesale organic market prices updated to the previous month. This site provides weekly wholesale organic price analyses with trends. Run by Edagricole, an Italian publisher of agricultural related books and magazines (owned by the General Confederation of Italian Industry by means of Il Sole 24 Ore, the best Italian economic newspaper in circulation). Now in its sixth year, it is the most complete and renown directory of organic products in Italy. Unfortunately it is published only in Italian. It contain a list of more than 2 400 companies producing or trading in organic products, including processors and importers. It also has some useful informative sections, mainly for the consumer. It is published by Distilleria EcoEditoria, which also publishes a bi-monthly fax newsletter as well as a general information Web site. A very complete site managed by IAM-CIHEAM with a lot of information on the organic market and a lot of documents, academic literature and an R&D database. 1 These are defined on qualitative grounds by the farmers themselves and by certification inspection bodies as "predominantly devoted to fruit and vegetable production". This means that the figures shown do not necessarily represent land used only for horticulture, but also include other land use (mainly cereals and pastures). 2 For 1999, EC Reg. 2078/92 expenditure data measure by measure are not available. 3 Many farmers with marginal and small holdings only produce for agro-environmental income support (organic aid) and have too small quantities to be sold to wholesalers who often are not located in the same areas. Besides, the cost of certification (apart from inspection) can be too high for such farmers, and they prefer selling locally without any certification. 4 The same chain has also launched the logo CarneSì, specialized organic butcheries. Altogether, the Naturasì/Carnesì outlets sum up to 25. 5 This survey was supervized by Raffaele Zanoli on behalf of INIPA-AGER, the research body of the major Italian national farmers union (Coldiretti). 6 Often specialized shops tend to offer higher quality local produce or Biodynamic grade in order to distinguish from supermarkets. 7 Some organic specialized retailers dislike the energy consumption associated to long-distance imports and try to "educate" the consumer to buy seasonal produce. 8 However, pears and apples are imported from Argentina, and some grapefruit and dates from Israel (countries with equivalence regimes according to EC Reg. 2092/91). 9 Egypt is a growing supplier of most labour-intensive vegetables, such as carrots, garlic, onions, potatoes, etc., in and off-season. 10 Until an EC official note blocked pineapple imports due to the chemicals used in the fruit setting and development phase. 11 These are the already mentioned, unpublished ISMEA-NielsenCRA telepanel survey and the unpublished telephone random sample survey of 800 Italian households performed by Prof. Zanolis team at the University of Ancona. 12 Equivalence, indeed, reduces the certification costs: apart from other considerations, inspection is also a labour intensive activity and doing it in the exporting country by local inspectors is cheaper than by higher paid EC inspectors, coming especially from the importing countries. 13 Actually no Italian supermarket imports organic fruits and vegetables directly. If no changes will occur in organic import laws, third countries will have few chances of a large increase in sales volumes.